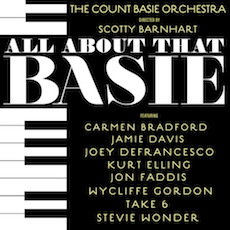 It’s the 80th Anniversary Tour, celebrating 80 years since Count Basie first formed his Orchestra. William James “Count” Basie breathed his last in April of 1984 – and only a couple of the members of this current line-up ever worked with him – so the ongoing orchestra is about honouring a sound and form; celebrating through the music. Trumpeter and musical director Scott Barnhart efficiently conducts the sharp set of horns and receive all sorts of clever tricks, such a Clever Guyton Jr soloing at a rather dizzying pace on a piccolo and the dead eye aim of the drummer’s cymbal-choke; the dynamics of the rhythm section were particularly impressive pushing the tempo without ever troubling the volume. These are players that can knock the tunes out swiftly without ever getting too loud. No mean feat. And we are talking about players that have worked with other big names in jazz – and of course are filling the stools of so many legends, not only Basie. Vocalist Carmen Bradford performed a small handful of songs in each set. She’s got a spot that was once owned by Billie Holiday, Frank Sinatra, Joe Williams and Ella Fitzgerald to name just a few. It’s the same with the other and members though – Freddie Green, Jo Jones, Thad Jones, Frank Foster, Lester Young, Clark Terry, Harry “Sweets” Edison, Sonny Payne, Buck Clayton…the Basie Orchestra was one of the training grounds for legendary talent. And this slick but charming version of the band boasts plenty of great players. It’s the setlist though – the song selections. That’s the real magic. Hearing stately ballads and brassy blues drivers, hearing Duke Ellington’s In A Mellow Tone and then the rip-roaring Basie Land, hearing Bradford handle Young and Foolish or the turn-on-a-dime skill from the whole ensemble on Frank Foster’s Who Me? A cynic might want to tell you this wasn’t the real thing – but jazz lives and breathes and these players had it in their hearts and souls. And they gave it a good shine and handed it around.